Western Colorado is known for fruit production, especially in the area of Palisade. In the past there were a variety of orchards spread throughout our region. Once the land was irrigated agriculture picked up quickly and by 1892 there were quite a few fruit growers in the valley. 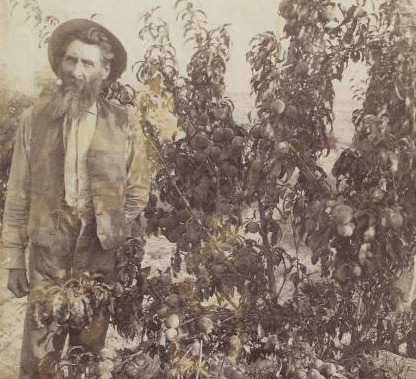 Peach, apricot, apple, and cherry trees were plentiful in the area of Grand Junction and what is now Orchard Mesa and the Redlands. The Grand Valley Fruit Company owned a few large sections of land in Mesa County. 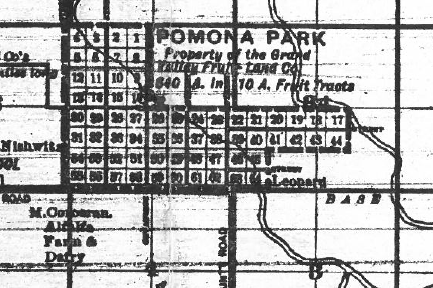 One of the largest of these plots was a 640 acre area called Pomona Park. The 640 acres were divided into 64 tracts in the area of what is now Mesa Mall. Other nearby operations included M. Corcoran Farm & Dairy, A.A. Miller Orchard, and Caswell’s Peach Orchard to the southeast of Pomona Park. Another large-scale operation was the Fruita Town and Land Company, which consisted of over 500 acres. William Pabor, who came from the Front Range, recognized the agricultural potential and set about promoting the local market. Pabor founded the Fruita Town and Land Company soon after he first visited western Colorado. Fruit production was in full swing and very profitable by the early 1900’s and it is still important in the local economy today.